The Catapult fleet is returning to Stone SC in Essex for our TT event 30th July-1st August.The TT is being staged as part of Stone Week, running over the first three days of the 5-day regatta. Catapult sailors are welcome to take part in the whole Week, which continues for the Thursday and Friday, if they wish. 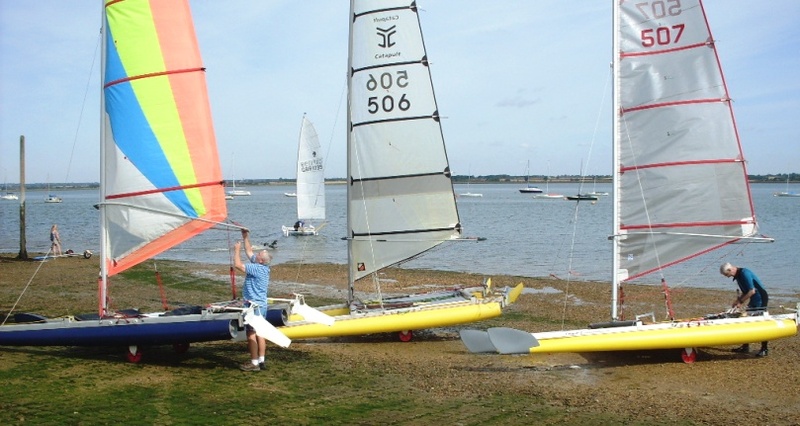 Sailing will be on the Blackwater estuary, which provides excellent tidal water racing. Paul Ellis (pxmellis@aol.com, 01245 224636) is the Association's liaison person for the event. The local contact person is the Sailing Secretary Caroline Crispin (01621 828108, 07885 461170, csbstonesc@hotmail.co.uk ). Racing programme There will be two or three races per day. For our TT one discard will apply once four or more races have been sailed. The first race on Monday is at 11am. The Commodore's reception on Sunday evening is billed as an opportunity to meet the Stone SC team and be briefed on the Week, so you are advised to arrive and set up your boat on the Sunday to be sure not to miss the action when sailing starts on the Monday morning. Sailing at Stone. Boats can be rigged in the parking field close by (and cars can't come through the Club to the shingle beach during Stone Week.) As shown below, the hard is firm shingle with launching at any tide. With flat land all around, breezes are unobstructed from every direction. The estuary is wide at high tide with plenty of sailing water still at low tide. Tides are the main tactical challenge, running strongly at peak flow (and kicking up a chop when wind and tide are opposed) so keeping boat speed is a priority. How to get thereThe Club address is Tinnocks Lane, St. Lawrence Bay, near Southminster, Essex CM0 7NF. A map and directions can be found on the club website (www.stonesailingclub.org.uk). AccommodationThere is limited camping for tents only on club grounds on a first come, first served basis. You may be able to reserve a slot by ringing the Sailing Secretary. The club website contains a lot of information on campsites, B&Bs and hotels (look under Accommodation on the home page). Although it will mean commuting to the club, you may want to book an alternative of which there are a number on the picturesque Dengie Peninsula. The entry fee includes the Commodore's reception on Sunday evening (snacks included), the Monday evening social with a live band, the Quiz Night on Tuesday (with nibbles), and the Barn Dance and Barbecue on Wednesday evening. Full meals on Monday and Tuesday are not included in the fee. However, the galley will be providing meals and snacks from breakfast through to dinner. As a guide a typical two course evening meal will cost about �12-15 a head. The bars will be open from noon until late. There are two bars: a 'wet bar' downstairs (for that quick pint after racing) and the main bar on the lounge deck. If you are staying for the whole week, there is another live band on the Thursday evening and the Prize Giving Dinner and disco on Friday evening to round off Stone Week � all included in the entry fee. Local attractionsThere is plenty to do for all the family. All the seaside pleasures of Southend-on-Sea are just a short drive away. Nature lovers can visit the National Trust sites at Rayleigh Mount (featuring a windmill and the site of a motte and bailey castle), Northey Island bird sanctuary and the ancient woodlands at Danbury Commons and Blakes Wood.